It’s safe to say my first encounter with Jon Rose was a memorable one. Having just completed a concert at the Now Now festival in Sydney in the early ’00s I was introduced to Jon, who promptly told me he was “unimpressed” with what he’d just heard. I must confess, I was intrigued to meet someone so willing to launch head long into criticism of a peer’s work during their ‘first date’. The conversation continued, and Jon outlined his doubts about the laptop as instrument, as well as a few aesthetic issues he felt marred the piece presented. I walked away from this conversation with two things. The first was some questions to consider over where my work was headed at that time (useful question too – critical and considered – including what role computers might play in improvised performance). Secondly, and perhaps more importantly, I left with a healthy respect for one of Australia’s lesser recognised national treasures. Jon Rose is a tireless worker and even more so a tireless experimentalist. A violinist with a devout passion for the art of performance, his work spans four decades and has charted out a divergent, yet not unrelated sound world. He has created an uncompromisingly personal sound space, one in which questions of performativity, expression, environment and what role music can play as an agent of education and inspiration are all addressed. What unites Jon’s work is his willingness to question the fundamentals of his practise, not merely in a self-reflexive way, but also through a broader social and cultural lens. 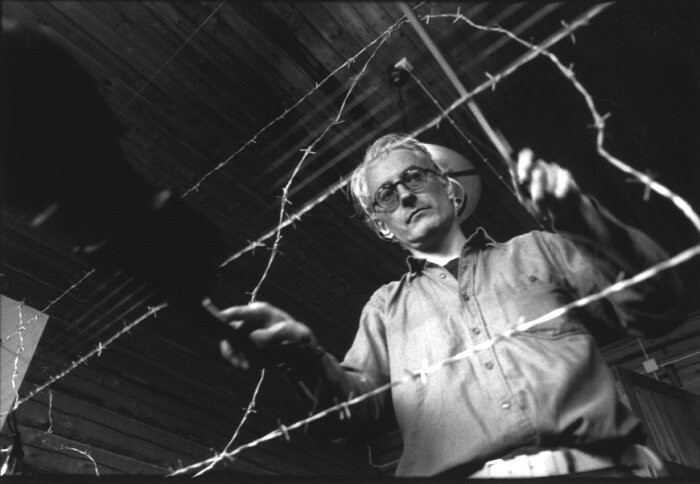 Examples of this abound, including his infamous works exploring and playing fences in the outback, which he records. Elsewhere, his work has created not just new designs for violin (double necked, 16 string microtonal and too many others to list), but has also revised how the violin could be used in conjunction with other technologies to reach new sonic possibilities. He’s also presented numerous incursions into public spaces – Violin Solo At The Sydney Opera House being a particular favourite of mine. Rosin, the four disc boxset of his work issued by ReR, is both enthralling and exhausting. This is a collection that summarises so many ideas that it’s difficult to take them in without allowing several weeks to for each disc to unfold. I found myself wondering how Jon had found the time not only to create this vast output, but also to conduct the research required to provide these pieces with the context and framework they need. Many of the works aren’t simply improvised excursions or cursory composition – they also involve the creation of new instruments and techniques and, quite often, extended periods of research into various social, political and environmental concerns. They are universes unto themselves, much like their creator. In essence, Jon Rose represents many things we (musicians and otherwise) should aspire to – to be restless, dedicated, willing, to have a sense of humour and most importantly of all, to be uncompromising. He is a rare breed – especially here in Australia: a composer, philosopher and player sitting at the edges of many scenes and movements, yet someone who has remained affecting and produced work entirely on his own terms. Rosin collects truly Australian music that resonates across the face of the planet. May there be more to come. Jon Rose’s 4 disc Rosin compilation is out now through ReR Megacorp. Lawrence English is a Brisbane based musician. Lonely Women’s Club – his most recent collection – is out now through Important Records. He runs the Room 40 label. Rose was keynote speaker at the Music & Environment Symposium at UTS earlier in the year. Conference proceedings should be getting published in the Journal of Music Research Online, so I wonder if you might find his talk there soon, if yr interested…?